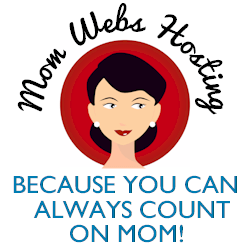 I participated in a campaign on behalf of Mom Central Consulting for Sturm Foods, Inc. I received a promotional item and product samples as a thank you for participating. Every morning, before my day really starts, I take 15 minutes to myself to enjoy a hot cup of coffee and catch up on the news. I wait until my daughters have gotten on the school bus so the house is nice and quiet, and I can sit down without any interruptions. It’s great to start the day in a relaxing way. There’s something so comforting about sipping a warm beverage on a cold winter day! 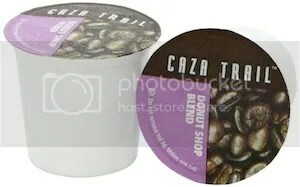 Lately, I’ve been drinking Caza Trail’s single serve Donut Shop blend and it’s delicious! Rich, but not too strong or bitter. I guess you could say it’s a mild roast. It’s also a good value compared to other brands. Having a single serve portion is so convenient because I can just pop one in any time I feel like it, not worrying about wasting a whole pot of coffee. It’s good portion control, too, since I try not to have more than 2 cups of coffee a day. 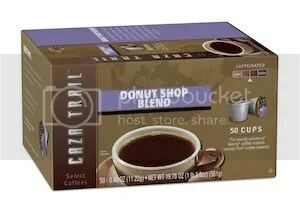 You can find the Donut Shop blend and 24 other Caza Trail varieties on their Amazon page. I’ve got my eye on the Pumpkin Spice and Gingerbread!